At the time of the banking collapse, the Bank of England said that there was a need for more stable banking structures in the UK. So why isn't George Osborne remutualising Northern Rock? Reports in the press this morning about Northern Rock have focused on the bank’s (albeit reduced) losses in the first half of the year. However this is the wrong story. The taxpayer is very likely to make a good return on the investment into Northern Rock and therefore the government has made a grave error by failing to either to convert the Rock back into a mutual, or selling it to an existing mutual. A year ago the nationalised Northern Rock was split into two entities: Northern Rock Plc and Northern Rock Assets Management. Northern Rock Plc is the deposits and branches part of the former bank and UK Asset Management is now managed under the umbrella of the UK Asset Resolutions, together with mortgages from Bradford and Bingley. UK Asset Resolutions has been highly profitable. Last Friday, UKAR announced half year profits of £ 430 million. The Rock’s balance sheet made £290 million, and B&B made £130 million (these numbers are pre-tax, because it’s returns to taxpayers). Last year, UKAR paid back over £1 billion to the government. Either if the mortgages in UKAR are kept on the public balance, or if they are sold, the government is highly likely to cover the cost of nationalisation and preparing Northern Rock Plc for a sale. With the cost covered and a profit gained for the taxpayer from NRAM, we argue that the future of Northern Rock Plc should be as a mutual. The Co-operative Party’s campaign for Northern Rock to be remutualised continues. Our party chairman provided George Osborne with a plan for a member buyout of Northern Rock plc: involving the creation of a building society with the current depositors and borrowers of Northern Rock plc as members, who would then finance the purchase of the branches and deposits and asset book of Northern Rock through the issue of a dated subordinated bond in the sterling bond markets. We estimated that this would raise £ 300 million for the government, and would create a stable building society that would prevent the recreation of the demutualized banking sector that so spectacularly collapsed in the autumn of 2008. The Co-operative Party’s campaign is premised on the complete failure of mid-sized mortgage banks during the financial crisis. All the demutualized mortgage banks have disappeared, and their weakness at the heart of our financial system made us much more exposed than other countries. By contrast, mutual building societies are much more robust and much less likely to cause systematic failure of the UK banking system leading to public funding bailout. Government policy on Northern Rock should recognize this failure and therefore avoid resurrecting that failed model. In addition, it is no accident that building societies have dropped out of the auction for Northern Rock. Their business model is a much lower risk than the one the private equity buyers will run. Coventry Building Society’s Tier 1 ratio is 18%. The minimum Tier 1 for a private equity run mortgage bank will be around half that. A halving of Tier 1 implies a doubling of the mortgages the bank will lend. As returns depend on the spread between what the mortgages lent versus where the bank finances (currently a spread of around 2.5%), a halving of Tier 1 ratio implies a doubling of profits. The current absence of building societies from the auction reveals a much riskier model for the future Northern Rock plc, and should already cause concern. Of course, the future cost of a collapse will be borne by taxpayers, rather than financial institutions. This has led the Bank of England to argue that we should promote stable banking structures, to lower the risk of systematic collapse. The Government is doing just the opposite with the sale of Northern Rock Plc. The “winner’s curse” is how economists sometimes refer to the problem of paying too high a price in an auction. In the case of selling off Northern Rock Plc, the curse may come to afflict us all. Should we be selling the Rock to the highest bidder no matter the business model? Surely we should be considering the wider risk posed by such a sale. The policy decision by Mr Osborne to flog off Northern Rock speaks volumes about the government’s lack of commitment to building a safer financial services system. So we would suggest that taking the profits from the mortgages of Northern Rock and Bradford and Bingley plus £300 million from a new remutualised Northern Rock is more than recompense for the taxpayer’s intervention, and if the independent Northern Rock returns as a building society, it’s one less weak link in our financial system. 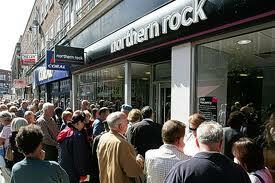 The way they run northern rock is a complete joke.. still. http://www.investoo.co.uk/standard-charted-profits-on-the-increase/ look at standard chartered, they are a shining example of how to work in the finance industry. The government should look to them for help. In other words, you want the government to sell state assets to the lowest bidder for ideological reasons. Why doesn’t Coop buy it? I think you fundamentally misunderstand the nature of a mutual, if you think it’s a “lowest bidder”.